As your insurance company, we need to know the current value of your wedding rings to provide sufficient coverage to repair or replace them. Keep the original purchase receipt on hand and make sure to inform us with details about the gem’s four Cs — color, cut, clarity and carat size. Don’t toss that receipt! If you need to replace your ring, you’ll need to provide some paperwork for a speedy claims process: the original receipt, the appraisal certificate, any warranties or coverage policies from the jeweler. Keep everything together in a file or folder so that it’s organized and easily accessible. Also, use photos to document your valuables. 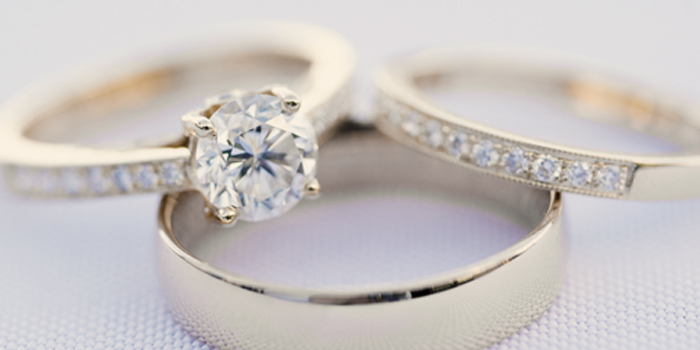 If you already have a homeowners insurance policy, call us and ask about coverage options for your rings. Most homeowners policies provide minimal coverage for jewelry and high-value collectables, so you may need to purchase a “personal articles” or “floater” policy to provide protection for these items. This way, if you lose your wedding ring while scuba diving on vacation or damage the metal band while working, your policy will pay the cost to replace or repair the ring. There is an extra cost for these policies, however, and this cost will be determined based upon the value of the items you are insuring. Talk to your agent to learn more about these policies. At home, invest in a safe for when you aren’t wearing your ring. When travelling, be sure to stow away your rings in the hotel room’s safe. While it’s good to know you have insurance in case something happens, you should always take precaution to protect your rings as best as possible. This article is a re-post from our partner Mercury Insurance, written by Marissa Hermanson and can be found here.